A few weeks ago I said that I couldn’t get a founder to talk me about his inner-critic. I finally did it. Towards the end of the interview you’ll hear Amit Mehta describe what I’ve called the Counter Mind, and how overcomes it. But don’t miss the first part of the interview because that’s where you’ll see how he built his company and understand what, I believe, we can do when we overcome the noise in our heads. Amit Mehta is the founder of Moblize which provides monitoring software to energy companies. Andrew: Coming up… You know how I’ve been saying we need to get past discussions about search engine optimization, and how we get more traffic, how we get more orders, and all that stuff. We need to keep talking about [inaudible[00:00:29]) search. But there needs to be something else that we haven’t talked about yet. There needs to be something else discussed, and that is, of course, inner doubt. That inner negative self-chatter that we sometimes have in our heads. Well, as you probably have heard me say, I haven’t been able to get an entrepreneur to really talk about it until now. Here’s a successful entrepreneur who’s talking because he’s aware of it. He’s talking in this interview about the negative chatter that went on in his head or could have gone on in his head, and how he dealt with it, how he overcame it, how he was able to build a successful company despite it. The way that he did it, I think, is incredibly instructive. If you are at a period right now where you are full of self-doubt, or if you have been and think you will be, what that part of the interview. You will thank me. Also, you’re going to hear about how he got a customer in the most amazing way. If you’re someone who’s a nobody and still need to land a huge customer, the way that he did it will inspire you. All right, all that and so much more coming up. Listen up, hate to have commercials interrupt this interview? So, I’m going to tell you about three sponsors quickly now, and then we’re going to go right into the program, starting with Walker Corporate Law. If you need a lawyer who understands the start-up world and the tech community, I want you to go to WalkerCorporateLaw.com. Next, I want to tell about Shopify. When your friend asks you, “How can I sell something online?” I want you to send them to Shopify and explain to them that Shopify stores are easy to set up, they increase sales, and they’ll make your friends’ products look great. Shopify. Finally, I want to tell you about Grasshopper. Do you want a phone number that people can call and then press one for sales, two for tech support, etc., and have all of the calls be routed to the right person’s cell phone? Well, get your number from Grasshopper.com. All right, let’s get started. Hi there, Freedom Fighters. My name is Andrew Warner. 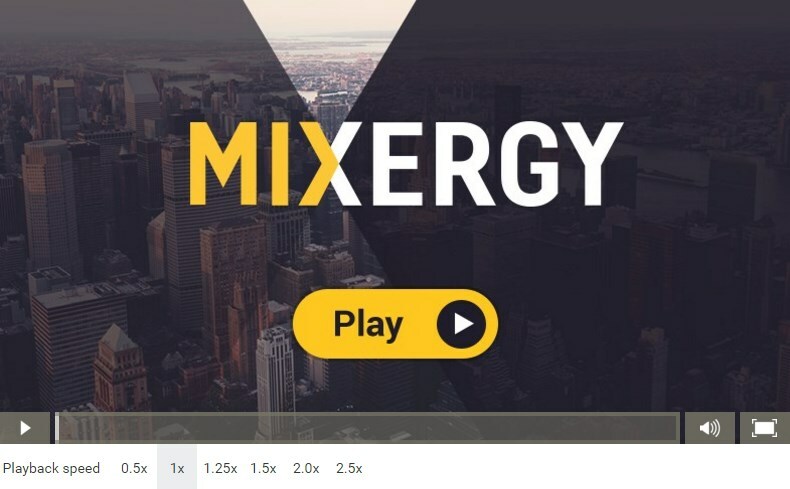 I’m the founder of Mixergy.com, home of the ambitious up-start and the place where proven entrepreneurs have come here for years now to tell you there story so you can learn from their experiences, build your own success story, and hopefully, once you do, you’ll return back here and do an do an interview the way today’s guest is, and share what you learned along the way. And in this interview I want to find out, “How do you build a fast-growing start- up when you have to sell to slow-moving companies?” Amit Mehta is the founder of Moblize, which provides monitoring software to energy companies. Amit, welcome. Andrew: You had, at one point in your life, three dollars and twenty cents to your name, and you decided that you wanted to meet someone. Who was that person? And you’ve got to tell the audience how you met them, because this is an inspiring story. Andrew: He had to put a restraining order on you? Seriously? Amit: No, he joked about it. Amit: He joked about it. And he finally gave the meeting and he said, “Okay guys, this looks good. Where is the business plan?” And I was like, “Oh. I don’t have a business plan.” And then he said that, “Well, we’re Chevron. We look at a hundred business plans a month, and we only invest in maybe less than a percent of those companies. So that doesn’t make you very special does it? There’s no way we can continue talking to you, and it was nice to meet you. And then I essentially got him thinking right there that the typical companies you end up investing in are far away. I made him realize, and I really talked from his perspective. Because I knew from his presentation that typically when Chevron’s looking at business plans it has to kind of save Chevron money, right? That’s the number one goal. And obviously every corporate executive has his own internal performance measurements as well. How to get technology from cash to idea which could be exploited by Chevron and other energy companies. So I kind of knew all these many points which he talked about at that conference. I basically used all of them on him so he really had nothing to do but say yes. The way I did it is I said, “Well if Chevron has to build this thing internally it’s going to take probably two years. We can do it in less than six months.” That got his first attention. Then I said, “If I had a business plan, how much would you invest in this company?” And he said, “Well I’ll buy 30% of it.” So he gave a number which was a pretty significant number. And he said, “Well I think I can value the company at this number if you had a plan, because it seems like you have a good technology.” And I said, “I’ll tell you what. Why don’t you just fund us in tranches?” That lowers your risk. So if you were going to fund all this money it can affect your performance at the end of a year if we fail, right? What if you actually invest only 10% of that? I think he just probably liked that confidence right there. And once we got the first tranche and the second, he said, “Oh, my god. I just have got to give you the whole money.” And that’s how it happened so I never had to do a business plan or an executive summary, a traditional way of doing things. Andrew: Talk about persistence and at the time as I said you had about $3 in your pocket, we’re going to talk about how you went from there to here. But just say the revenue. You showed me your financial before we started on camera. And I won’t betray your trust. I’ll let you reveal whatever you feel comfortable saying about where your revenues are today. Amit: What are revenues are today worldwide are in double digits and we have a fairly decent gross margin as well. So that’s all I would like to share with you and the audience. Andrew: Wait, that’s it? I thought you were going to say even more. I saw the numbers. They were very strong. Why don’t we do this? Can you say over a million or less than a million in annual sales? Amit: I would say over $15 million in annual sales worldwide. Andrew: Okay. All right. We’ll leave it at that. I’m not going to push. I just want to give people a sense of the size of what you built. And when you came up with this idea you were consulting on oil and gas? Andrew: What does that mean you were consulting on oil and gas? Amit: Well, you know, it was just like doing consulting assignments. Essentially when I moved to the U.S. I was working in consulting. So there’s a company called Science and before that I spent some time at McKenzie. And that’s a way to kind of learn the way to consult with organizations. It was just projects we were doing in oil fields, and I saw this big opportunity. Andrew: It was an opportunity in the form of a problem, right? Andrew: What was the problem that you saw that they had? Amit: The biggest problem in oil fields has always been that a lot of these service providers like Shlummer [sp] Jays, Halliburtons and the big billion dollar corporations out there. They all manufacture their own tools which go down hole when you’re drilling a well. And they all try to lock the customers, meaning operators like Shell, BP, Chevron, the big names in their software. Which makes sense because if I’m buying your tools, I want to lock you into my software to visualize and analyze that tool as well, right? So that way I’ve always locked you in. What I always believed is the future is Internet, ubiquitous [SP] systems. You should be known by the value you bring, not because you can lock something, someone in proprietary systems. What we did was really focused on the dimension of that if we can convince the oil companies that when these tool providers, i.e., the service companies, are providing the visualization and the tools themselves, that’s like a fox guarding the hen house. Andrew: I think software now is making sure that the tools that they sold you does what you wanted it to do, and that’s no way to check. It’s like if you’re auditing, audited financials that you showed me before you started was audited by you. Amit: Correct. Exactly. That was the idea. We were like, “You’re making multimillion, billion-dollar decisions on this data which is being recorded or sensed by their tools, right? I said to them, it’s just common sense that if I am providing you the tools and I’m providing you the visualization on the tools, why would I ever tell you the tools are working or not? That’s like a fox in the hen house. You need an independent data watch dog, just like you need cops around to watch citizens, right? Just like you need regulatory bodies for other things. Just like you need a black box on a plane when something happens. You need something like that which can ensure that if things ever go wrong, there’s a neutral vendor out there who is actually making sure everything was being done right from day one. Not just that. The idea was with Moblize being there, all these tool providers become a commodity. They have to now win business more and more on their value and service than just their tools. Imagine, if Halliburton, Schlumberger and Baker Hughes are working on the same oil well which you’re drilling, with our technology, you can replace either/or based on their performance. Earlier you couldn’t because you’re stuck with their tools, you’re stuck with their software, so cost of change is dramatically high, but now it isn’t. With the flip of a switch–the way I explain this in layman’s terms always is, if we go to different countries and we use an ATM machine, it doesn’t matter what ATM machine we use, the size of the card and the hole in which the card you actually insert to draw the money, it’s standard. We can [??] them on the future is standards. Let’s work on standards where you could be anywhere in the world drilling an oil well. You could use any company, any tool provider like Schlumberger, Halliburton, Baker, Weatherford and all that. When you have Moblize on there, you’re not only getting a bird-dog view of all the data as an independent provider; you can switch them on the fly if they make a mistake. The key is everything coming to you in offices on one common visualization platform. That was [??] proposition. Andrew: They don’t want to be made into a commodity. They don’t want their products to be interchangeable. Amit: Yeah, that’s why they hate us. Andrew: How do you get when they don’t want you in the space? Amit: Well, you find the visionaries, you find the people who are forward thinking, and that’s what we did. We found people at Chevron who are future thinkers. They introduced us to the right people. The way an oil field always works is it’s very, very slow to adopt things, but it’s a very close- knit community. Their marketing budget doesn’t have to be as high as a typical other industry [??]. Your marketing budget could be less than a percent and you could still get decent business because they’re all connected. It’s like the old boys’ network. Even when we were doing this, we were taken as, “Oh, these are just young kids. Who are they? No one’s going to take them seriously.” It was like if 99 people said, “You can’t do it,” that’s when it became to me, “Yes, you can do it.” If 99 people say you can’t do it, I think that just became a motivation to actually make it happen. It was more decided, more done not that we were just trying to solve a problem. It was to prove people wrong. It’s imagination which rules the world, not just logic all the time. Andrew: There was a point, like I said in the beginning, where you had $3.20 to your name. You were living on the floor of your friend’s house. Is that right? Andrew: You told April Dyckman [SP], who pre-interviewed you, that you at one point cried to God, “Why are you doing this to me?” Talk about that. I want to hear about the confidence that you had, but I think we could identify with this low point if you can talk about it openly from memory. Amit: I’ll try to recollect what I can because it was a couple of years back. The way it happened is–you want a whole story, or you just want to focus on what drove me to keep doing it? Andrew: Let’s get the whole story and then what drove you. Yeah, let’s get the whole story. We have time here. Amit: Essentially, I’m a big believer. I think my dad taught me this early on. If you have faith in the future, there is power in the present. I am a big believer of that concept. It was that faith, it kept going. I always believe, when you build a diamond…a diamond is discovered in a coal mind…and is subjected to a lot of different process before it becomes a diamond. Women go and buy diamonds at a very expensive price. To me, to become a diamond, you have to be subjected to 1000 Celsius. To me it was this concept, as hardships increase, your faith also expedientially increases. I have always believed that everyone has strength to make things happen, they just don’t have will to do it. I felt it was a good test of wills that we have to keep going no matter what happens. If you know you are highly educated you can always get a job, right? But I am a big believer you have got to try once to make a big difference. I think it was that test from God, I think it was the first time I ever cried. I looked up at the sky and I said, “Why are you doing this to me?” We were living, for a couple of months, sleeping on a carpet, with 3 people living there. This is going from a high-flying life; making six figure money. And now, living with everything in storage and sleeping on the carpet. You are essentially living hand-to-mouth and then they evict you. You come back from Starbucks, which used to be the office, and all of your luggage is outside. These guys said it was illegal to have me stay there. I said, “Oh, fine”. On top of all of this it starts to rain. It was that moment that I looked up into the sky and cried, for the first time ever and thought, “God is really testing my will here”. And I said, “Until that goes to zero I am not quitting.” That’s just the way it was. Andrew: Some people might be noticing that I am holding a mug by Industry Arabic. It’s a company created by Mixer G fan named Will Ward. I asked my audience to give me mugs with their logos on them and I will hold it up in the interviews so people get to see your company. He does translation from Arabic and I met him when I lived in D.C. where, obviously, there is a big need for his service. Anyway, he sends that to me along with this incredible note, I will tell you in a moment why I am showing this to you, all hand-written, and he says this is why he loves Mixergy. He says, the pain, the fear, the insecurity that entrepreneurs talk about when they feel like a fraud, those moments that they don’t really admit in other interviews, in other programs, this is what he learns the most from. Let me ask you. Can you talk a little bit more about what was going on in your head? For people like Will Ward who know that there are times that even the most powerful people will have insecurities. How does insecurity express itself in your head? When my hand came she said, “You don’t need luck. You’re going to fail anyway.” Imagine hearing that as a 14 year old kid. What do you go through? Again I was shaken. I almost felt that all that preparation was probably going to fall today. But as I entered that room I don’t know what happened. It was that laser focus. I just zoned in so much on the actual goal I’m trying to get to versus the obstacles in terms of what people say and do. I focused. The result was I actually topped and shocked everybody. That day I knew I could make anything happen when I put my head to it. This is actually a story I learned from Indian mythology. Which again, thanks to my parents they shared that with me. I don’t know if you have time to hear this but I can quickly summarize for you. The first kid pointed his bow and arrow and said, “I see sky.” Second one said, “I see clouds.” Third one said, “I see air.” Fourth one said, “I see branches.” Fifth one said, “I see a tree.” When this kid came what he answered, the teacher said, “I knew that day he would become the number one archer.” Can you guess what he said? He said, “Eye of the bird.” So everyone talked about obstacles and he only talked about that actual goal. Eye of the bird. And he became the world’s number one archer. Amit: Can’t afford a date as well, right? Amit: I was just kidding. I was like couldn’t afford a date as well that time. Andrew: Couldn’t afford a what? Andrew: Oh, a date. So some people would walk into that meeting and just have those thoughts. They want to stop paying attention to them and start focusing just on the goal but they can’t shut those thoughts out. How do you shut those thoughts out when they’re coming to you? You know this old saying, right? You cannot live a positive life with negative thoughts. You have to kind of move those negative thoughts away for the moment and think about that one positive thought which could be anything. In my case it was that achievement. I really focused on when everybody said I was a failure as a kid. Getting zero in physics and math it can’t go worse than this. I turned around and that’s all I could think about, that moment. I was nobody that time. Here at least I have three daughters. Come on, I’m an adult. I’m an educated guy now. Why should I be scared? I think, I don’t know if it answered the question but I think that was how you take those moments and bring them in the present moment. I think people what they do is we all keep focusing a lot more on our weaknesses and our negative things we experience as a kid and let them affect our present and future. I try to keep those negative things out of it because to me past is history, future is mystery, present is gift. So you’ve got to really take the best of the past and apply it in the present and keep learning, keep moving forward. That’s why I was telling April, to me even if it’s wrong, it’s worth doing it first and figuring out how to fix it and never repeat it than just sitting on it and thinking and thinking. Andrew: All right. So now I understand the vision, the problem, the solution you have in mind. What’s the first version look like? It doesn’t seem like you can just put anything out there and sell it to energy companies. What does the first version of your product look like? Amit: I can actually give you a live demo if you want? Andrew: I don’t think I could show it online here. Maybe you could describe it and we could link it up for people? Amit: Can you see the screen at all? Let me see. Andrew: I’m worried that if we start to show it that the recording won’t do it justice. Amit: OK. OK. My bad. Andrew: I wish we had a good screen shot. Amit: Can you see my iPad? Andrew: Yeah. Describe it as you show it for people who are listening and not watching but, yeah, we can see it. Amit: OK. What this shows you is basically is two tiles, right? Imagine every tile to be a well. I’m just doing a demo, I don’t want to show live client data. That’s obviously propriety to the customer’s. If you notice, there are two bars on those green boxes. Each green box is a well which could be drilling anywhere in the world. Amit: Our thing was that you can look at a well at a glance anytime, anywhere, because we people are all busy nowadays. Nobody has time to look at a screen 24/7, right? We just want to look at things when there is a big problem about to happen. So in this case, the way the work flow works, is you can get an alert on your phone or your smart phone today and it will say, hey, there’s something about to go wrong. It can be a different type of alert. There are 100 types of alerts that could happen on a well. When they get that link, they click on the link just like you and I probably click on our Facebook links when we get a notification. We essentially log in to the screen. When you log in, you actually see this screen, which is popping up right now. Andrew: Can you hold it up just a little higher so I can see it? OK.
Amit: You see it? And what it does is, it actually lets me now analyze that alert. So if I click on one at the bottom it actually lists whatever alerts have been happening on that well. I can quickly click on that and it will actually pop up, right away, the last twenty minutes or 100 feet of data, in a visual format, so the engineer can actually review and see what was happening. What they can also do is they can play back, all of those things, if I play that back it will start to play how that alert was even being created when it was happening in real time. All of this is happening on different, two provider’s tools. Right? I don’t manufacture tools at the end of the day, right? All we did is we’re just making sure that we can take the data from those tools at the download, and if anything is going wrong on all the alerts which are set up on the system it lets the engineer who can be sitting in the Bahamas, at dinner with his wife, he can look at it, make sense out of it, and quickly have a call to action button where he can send it as an email or he can comment on it for someone else to look at. So it’s kind of moving more and more into social commuting in oil fields where anything they do can be shared with other people who are responsible for that particular well. OK? Andrew: This is a pretty involved piece of software. There’s a reason why there weren’t tons of upstarts who are competing in this space because it’s not something you could whip up in your dorm room overnight and then sell. How did you create the first version of it? Amit: I think the way you do it is you learn from the best. So the way we have always done it is you make your customers your partner. You never be their vendor, right? Moblize, one of our seven pillars of the company has always been passion for customers, and we really mean that to the heart of it. And how we have done things is, a good example I will give you, one of our clients right now, who I don’t want to name, is going through some hardships, right? They pay us, on top of everything they pay, they pay us close to $800,000 a year on a certain part of our service. Without them even asking for any discounts we internally figure out how we can save them that $800,000. We just sent them an email saying we have done these different models and based on efficiencies we are gaining we can reduce this to zero for you. Andrew: Your price, to them to zero? Amit: Our price, yeah, $800,000. Andrew: How do you go to zero? Amit: The reason you go to zero is because you make it more and more automated. The thing we were thinking of making automating in two years we actually automated for them now so they can start seeing that cost saving today versus two years from now. Right? When we did that, they were shocked because they said they have never worked with a company who essentially came to us and said oh, you were paying me 800 and you don’t have to pay me 800 now. It’s just like your reaction, right? And I think these small things go a long way in life. Andrew: When you’re starting, and you’re not a developer yourself, you do develop Version One of mobilize. How do you get Version One together to take to Chevron and hit your goals and get your investment tranches as you were promised? How do you develop the first version? Amit: I think the way you do it is, you essentially bring more people who are software developers, which is what we did. Kind of, you know, and essentially you can connect them with the experts and the engineers at Chevron. And let them quickly build together, because, Chevron’s has developers, but Chevron’s very process-centric, right? So, that was the value, if they could have done the same in two or three years, we could have done it in 6 months. Amit: I didn’t tell them I was going to hire developers. I just said, Yeah, I’ll just get it done for you. Just don’t worry about it. Andrew: And then you did go hire developers. Andrew: And then, you introduce your new developer to Chevron. You said, Chevron, teach him what he needs to know so he can build for you what we promised. Andrew: And then they did it and they paid you, they paid the investment money. Amit: Absolutely, after they saw the results in two tranches, they were, like, wow, if you guys can do so much in less than, in less then, you know, five, I think it was a four month period, we have no doubt in your abilities. And, that’s how it was done. Andrew: So, the reason you did this is because, first they wanted the money- savings that your software was going to give them. And, second, they were getting a share of this business, so they had an interest in developing it with you. Amit: Exactly, and I think the third big thing was, a lot of these corporate venture groups, when they’re investing they’re also looking at their, you know, it’s about their person’s own bonuses as well, right? And, I made them realize, more and more, about this concept that, you know, time-to-market is critical, like oil fields are more complex in a competition is doing, always looking at our seas and what-not, right? You can get everything, everything I do you can do as well. And I even tell that to my vendors, my partners as well. That you can do what I do, because everybody is smart these days, right? The question comes down to, what can you outsource quickly so that you can use your same people to do something other, which is probably a bigger opportunity for you. Right? And I think if you make people think like that, I’m a big believer of collaborative working, right, so if you make people think like that, reasonable people do agree with that. Now, we do find a lot of people in oil fields who have a, and that I think is still a big challenge. That they see, you know, they’re used to working with, and here’s probably and interesting, I would imagine… Average age at Moblize today is 35. And, it’s like, all these engineers who we work with are pretty much all in their late fifties, right? So, they don’t take you seriously. So, the way you make, you know the biggest strength. And the way we turned that around in our favor was, we said, the biggest strength young, energetic people bring is speed. The speed and agility, which is, actually, one of our pillars of Moblize, which is listed on our website. And we said to them, look at our speed and agility. We can get things done for you in 4 months which you will probably get done in 14 months. Do you really want to wait 14 months? If you wait fourteen months, it could affect your bonus because if you have it ready in fourteen months, it will probably yield, even if it works, and it gets deployed within different business units, it will take you almost two years to make your bonus. Or make your performance goals. Why can’t we enable that in this year for you. And, I think if you talk from their perspective, I think that’s what the key comes down to. Andrew: I keep hearing that. That, when you’re selling to bigger companies, you don’t want to sell just to the interest of the big company. You also want to sell to the interest of the person who is buying. His bonus, his ability to rise, his ability to shine. And you’re reaffirming that for me. Now, you’ve got Chevron. April asked you, how do you get customers after Chevron and you said, you started to speak at conferences and build, build relationships and spread the word. But, you also told her that it’s a long sales cycle. That, they, once they want to adopt it’s a tsunami, but it’s a really long sales cycle. So what got me through the process is that starts with you speaking at a conference and eventually ends with them paying you for your software. Andrew: You pay to speak at your conferences? The way we did it was we essentially would sit in the audience, and I’ll just ask all these questions which will make them think, “Wow, who is this person?” This will do two things. Right after the conference, at a coffee break, you go and say hi to the speaker. He gives you a card, and he starts talking to you. Believe me, I actually got three meetings with top executives who people would die to meet. I got a breakfast meeting with them just by asking interesting questions at the presentations they were making. Needless to say, one of them became our client. Andrew: When you’re saying, “I started speaking at conferences,” you mean speaking from the audience. Amit: Yeah, speaking from the audience, exactly. Andrew: You never got a break where you got to be the person speaking on stage? Amit: I do get that, but I have a fundamental philosophy. If I have to pay to be a conference speaker, I’m not speaking. Now most of my speaking– obviously, we get invited to speak, and they’re more around what Moblize is doing and blah blah blah. There are some conferences which we refrain to go for because you have to pay actually to speak there. There’s a big line, and everybody wants to be a speaker because they’re really big conferences [??]. Again, that’s something I feel was different, something different we did to get the attention from top people versus the conventional way has always been you go and get a booth. Moblize has, till today, never taken a booth at any of the conferences. Andrew: You can only ask so many questions at conferences, and that can only lead to so many new customers. What do you do beyond that? How do you get more customers? Andrew: Tell me a little bit more because I started out this interview making kind of a promise to my audience where I said I’m going to show them in this interview how you built a fast-growing startup when you had to sell to slow-moving companies. I understand how you sold to your first customer, Chevron. I understand how speaking from the audience got you another customer. I want them to see that it wasn’t just luck that people happened to spread the word about you and that’s how you ended up getting customers. It was more intentional than that. Give me one other thing that you did that got customers, especially in the early days. Amit: I think I would definitely owe it back to the conferences. A lot of people just go to a conference to say hello and network, which is a very traditional way of talking. That’s what everybody does. I go to conferences very strategically planned. I would always look at, “Is this conference worth my time?” Who is the presenter here? Like I said earlier, what we sell is to visionaries. You’re really selling the value of data. How many people, even in different industry verticals, it’s not easy to sell value of data. I would go to conferences where I would know visionaries are speaking. The way you know these visionaries is because you look at the topic at the conference and the technical session. If the topic is concerning, kind of in the realm you are, you go and you make sure that whatever two questions you’re going to ask, they want to talk to you. It’s almost like when you build a resume. You don’t build a resume to get a job; you build a resume to get an interview. Same concept here. When I would go to these conferences, the goal was, “Let’s just go here to wow that person who we think is a visionary.” If you ask the right questions, he would want to talk to you. “Who is this person from the audience?” I was present with 200 people. I think that’s another thing I’ve noticed. A lot of people are scared to ask questions. I don’t know, it’s just stage fright. People just don’t want to get up and ask a question. I’m just dying for that moment when that lecture stops so I can just get up and ask a question so the spotlight comes on me. That’s how we’ve done it. I think that’s probably the third, if you call it methodology, I’ve exploited where we’ve really honed in on these companies who have their visionary leader. If they’re talking, all you have to do is make sure you can get five minutes. And then you have to have enough confidence in that five minutes you can convince them they should give you another thirty minutes. I hope that answers your question but that’s how we’ve really gotten business going for us. Andrew: So businesses that are based on relationships are great with the relationships are helpful. But they’re painful when there’s backstabbing and betrayal. And you’ve faced some of that. Can you give me an example of that? Amit: Yeah. I’ve faced definitely a lot of betrayals. Not one, they’re plenty but I’ll try to summarize one or two. I think we were betrayed by one of the guys we hired in the U.S. It was a lesson learned and we backtracked it. We’ve been betrayed by some of the developers. You hire people, they back stab you and they leave. So we have had our share of betrayals but again the key comes down to is how do you learn from them and move on. I wish they taught how to address betrayals because I think one of the problems I feel I have is that I’m too trusting. Right? Now it could be taken as a good or as a bad, but again, you live and learn, right? So I feel that, I am who I am in real life and at business. I don’t have two different personalities at the end of the day. Andrew: Why did you trust me, by the way, with your financials? You showed me the audited financial before we started. You didn’t want me to reveal the numbers to the audience, you obviously didn’t want the audience to see this document. We went over it. I’m always curious when entrepreneurs show me so much. Why did you show it to me if you’ve learned not to be so trusting? Amit: That’s a great question. I think, earlier I could never calculate the – and again this comes from learning – earlier I could never calculate the value of betrayal but now I can, right? And I think that’s the experience of betrayal that I’ve learned over time. I kind of thought to myself, you know, if I show this to Andrew and yes if he tells the world, what is the value of harm he’s going to do? He’s not in oil fields. He may tell people, but you know who is going to listen to him in oil fields. So being bluntly honest, that’s how I was thinking about it. That’s why if you noticed, I only showed you one part, and that is our U.S. region. I kind of kept others away for that reason and that’s why I did. Andrew: OK. What else do I want to know here? Actually, let me just make sure that I understand this before we continue. You had someone who worked for you in the U.S. who went internationally and created a similar business to yours? Is that what you’re saying? Amit: No, no, no, no, no. He was our salesman who we hired to grow our business internationally. Amit: And he essentially betrayed us. Meaning he presented us numbers from there which were not true. And you know, when you’re first growing you don’t pay that much attention sometimes because you trust people, right? You’re like, OK, you’ve got someone. You’re paying them a hefty salary. And you hope you can trust them, right? This person, what he did, he did a deal with an agent there where he presented to us a number which was ten percent of what we should be getting. So the rest of the 90 percent was being shared between him and the agent. This is where I believe, you know I’m a big believer of whether it’s personal or professional life you have to be sincere. And if your intent is good then God is with you. I think that was the thing that at the last minute, somehow God exposed this person was doing wrong. I think a lot of the time they say entrepreneurs go with 1/3 luck, 1/3 intelligence and logic, and 1/3 instinct, right? I’m a big believer in my instinct because I would say at least 70 percent of the time they turn out to be right. So that instinct our intuition came in that there is something wrong here. It’s not seeming right, how can this be a ten percent? And boom, that’s when he got exposed. We quickly backtracked our steps and basically walked away from that part of the world to even do business in. Andrew: You mentioned God. In the past when people mentioned their faith, I guess it was one time when I didn’t give the person a chance to talk about it. I said to him, my audience came here to talk about business let’s shift away from faith and back to business, and the comments afterwards were painful. People said, no we wanted to hear that. So, what role does God play in your life? Amit: You know, he plays a very big role. I am not a fanatic in terms of God is everything for me. I believe he has given me all the right tools and the brain to work hard. That’s in my hands. You work with a lot of sincerity. Anything in life whether it’s relationships, professional work, or whatever, you work with 200 percent honesty and sincerity and if it doesn’t happen you accept it and you do the next thing. Versus, you keep cursing God that you didn’t get it. That’s the key difference. So, yes, honestly if you ask me who was God, I wouldn’t have an answer. I think humans, we humans, have kind of divided God into many different ways. I feel there is one supreme power out there and if you do right actions, you know, and if you don’t get something there is probably something better planned for you. But have that much faith. Andrew: When was a time when you had that much faith that you wanted something, you didn’t get it, instead of cursing God or saying something is wrong with me that you were able to shift away? What was one specific example of that? Amit: When I got zero in maths and physics. I think that was a time when I realized, you know, if God had not shown me that mom was crying, if God had not shown me that meeting, if God had not made me shake that person’s hand right before entering, I wouldn’t have realized my potential. Andrew: And that kid, that person’s hand, you shook hands and said you don’t need luck, you’re going to fail anyway. Andrew: Why didn’t that just echo in your head as proof positive that you shouldn’t even try? Amit: I would answer that by saying there are two wolves in a brain. The old saying goes that one is bad, one is good, who do you think is going to win? It’s who you feed the most, right? I would rather feed the good wolf than the bad wolf so the good wolf can beat the bad wolf. Andrew: I see. So in your head, the good wolf said you’re smart, you can do this, wait until he sees how you prove him wrong. If you would’ve succumbed to your bad wolf it would have been sitting there and thinking he doesn’t even believe me. Andrew: He’s seen so many students. Exactly you’re saying. Amit: So you feed that good wolf good thoughts at that moment and you say, you know what, that’s where faith in God comes in. If you believe in God, all of us know one thing, in every story and ever religion we have seen one of the key things I’ve seen is, even if they say God is nothing but an angel, an angel is a giver. It is never a taker. So you ask the difference between angels and devils. A devil is always taking, an angel is always giving, right? To me, if you are trusting in that angel who you know is a giver, right? And he’s part of your heart why do you have to worry about that aspect of being negative? So you’ve got to feed that with the positive wolf that you know, that angel is also with me, so don’t worry, just keep going, and keep going. Andrew: OK. So, at that moment when you were crying, when you were at your lowest moment, you chose to think back at the time when you were going to get a zero, you deserved to get a zero at school, and you pulled out a good grade. If you weren’t someone who could pay attention to his good wolf and you were the kind of person who could pay attention to his bad wolf, what’s an example from your past that you would have pulled out and just kept thinking about over and over and over. Amit: Wow, that’s a great question. I have to say that was actually probably a personal relationship and without going into too much detail, what I could say is that we all make mistakes. I’ve definitely fallen once in my life in love with someone who never loved me. So you essentially realize as a wakeup call that, and you feed the bad wolf at that time, that man, you did so much good but this person never loved you. Over and over again I did think about it. I think that was a definite moment where I realized, wow, if I see so much negative (??). So go back to that old example where you took a knight stand fought that negativity and turned out to be positive, and that’s what I did in that personal life situation. Andrew: So you could have thought, boy, I put all my energy into this relationship and I was stupid, it still didn’t work out. I was so stupid. I can’t make this work. And if you would’ve fed that bad wolf, that’s where your head would have gone. Andrew: Is there a part of business you could have failed in you could have thought about too? Amit: Absolutely, right after college, I tried to start this company where the vision was very grand in terms of we’re going to do this for Walt Disney. We’re going to build these characters and these characters will be online buddies of kids so when kids are done from school they can play with these characters. Basically, that just fell on it’s face because of three reasons. It was over confidence, that oh, we can just make this happen no matter what. And the thing was the fact from an industry trained perspective, the market wasn’t ready to have high bandwidths on smart phones and all that like we have today. For those two reasons it failed. And again, I took it as a very, I was definitely sad about it because it was love invested or some money invested in it. But you know, like every entrepreneur says you learn from failures and become better versus keep making those failures and keep thinking about them again and again. So I thought that was a huge lesson for me that never let confidence come into you. And I think it tends to happen with a lot of us, that overconfidence. All my friends they say You’re too humble, you’re too humble, you’re too humble. Like, even until today, I don’t tell too many people about who I am. I just say I’m a nerd, I’m an engineer, I work for Chevron, which technically I’m not lying. Chevron owns 20% of the company, right? So I will always say that because it’s important for me to be who I am versus money. Because money is a moving target. You can get it and you can lose it, right? And I’ve been in a situation where I have made plenty of money and lost it and made it again. But what I always keep consistent in me is my core values. They never change. So I firmly believe that you always stay humble in life and you always thank your angel or God for what he’s doing for you and you just keep moving forward. Andrew: I am so glad that you’re willing to talk about this inner mind thing because it’s been tough for me to get entrepreneurs to be in touch with that in interviews. And I want to just ask a little bit more about it before we go. Do you have to go or do you have a couple more minutes? Amit: I’m enjoying this. Go ahead. Andrew: So here’s the thing. Most entrepreneurs don’t get later or after they succeed, aren’t in touch with their negative thoughts and you are. You say I could have visualized the past business failure that I had and just dwell on it. I could have visualized this relationship that I gave too much on and thought that I was foolish or I was wrong. Were there specific phrases that would have entered your mind like I’m not an entrepreneur, I don’t deserve to be an American superstar business person. Anything like that that you had to fight off? Amit: That’s a good question. I would tend to say yes. You know, we all go through plenty of life situations where, you know, we do doubt ourselves. That’s just a human way to always act on things. So yes, you know, have I doubted myself? Many times, not once. Andrew: So how does it express itself in your mind, in your mind’s ear? What are the statements that makes the doubt? Amit: Doubt comes like things like, you know, can I really do this? Am I good enough to make this happen? Everybody else failed at this, what makes me so special to do it? Is that overconfidence again going to kill me which killed me earlier, right? So those are the kind of statements which do, you know, whisper in your ears all the time. Andrew: And so do you also have positive statements? And how do you shift to that? Amit: Oh, absolutely. I think that’s when I picture the negative wolf fighting the positive wolf saying Come on, Amit, you can do it. You know, come on. Andrew: Confront the negative. Like if the negative says You’re going to be too confident and this is why you’re going to lose. You’re stronger wolf, the positive side of your mind says what to it? Amit: Exactly. It’s a positive thing, OK, you’ve done it in the past. Why would you fail this time? You have been a fighter all your life. Why would you fail this time? You could turn around and [??] , so why this time? So I let those things, you know, hit those negatives and kind of push them away. And believe me, these negative do come a lot in the mind all the time but you have to keep pushing them out. Andrew: You’ve just become my favorite interview yet, I think ever. I’ve never seen anyone be this aware of what goes in on their heads and I try to get entrepreneurs to talk about this. Amit: Thank you. I appreciate that. Andrew: This is fantastic. When I’m done with the interview, would you come back and talk about this if I get some questions from the audience. Like where I know I am missing some aspects of this and I’m too close to it to know it. If the audience comes up with things that I missed, would you come back and answer it? Amit: I would love to. Andrew: I would love that. All right. Before we go, I’ve got to just quickly, not quickly, I’ve got to ask you about this new business because I did a search for your name. I did Amit Mehta Moblize and you know what comes up? Of course, your website. But I see Forbes articles about something called My Virtual Neighborhood. I see MyVirtualNeighbor.com on Forbes. MyVirtualNeighbor.com the website. MyVirtualNeighbor on PR. What is this? Amit: MyVirtualNeighbor is again, this is why I think I believe in God, you know, I always trust out a lot. So I was essentially on a conference and when I came back, I saw my door open where I live. And I walked in. Everything I had was gone. And I was like, “Wow.” I used to walk in my apartment in the past and I used to get those letters from my management which would say that, “Hey, someone got robbed.” And I would never pay attention and I would just throw it in the garbage can because it doesn’t happen to you. And we don’t take things seriously until it happens to us. And this time when I walked in, it was almost a flashback where, all those 3 months I was throwing away these notices that people get robbed around our surroundings where we live, and no one pays… no one really cares. Wow, what has happened to our world now? Right? So I, essentially, when I got robbed, it was almost like chills in the body when I walked into my place and there was nothing left. And I was like…I talked to some neighbors and I was like “Hey do you know what happened here?” And they were like “No, we were not aware at all.” And then I realized, Facebook is for friends and is doing really good there. And LinkedIn is good for connecting professionals, but there is a missing piece… which is, how do you connect neighbors? How do you connect people who live around you? And the reason I think both LinkedIn and Facebook and even Google have not heard about that niche is because, frankly speaking, it’s very hard to connect strangers, especially those who are living around you. So I took it on me that, “OK this is almost a dejavu,” that this robbery was a god-sign to me that I have to do something to solve this problem. And we started to basically put this together on the weekends and evenings. And now, it’s even becoming even bigger than Moblize, in all honesty. And I’m pretty confident about the whole concept and I have very, very good vision. And the key is, I’m pretty sure about this concept becoming big because…when you have lived in different parts of the world where there is lots of community feeling, and you see the actual value of that community, when you come to America and realize that America is lacking that…You know you have a lot of ideas to actually bring that…To make those weak ties stronger. So I’m very, very excited about this new venture, which still stays on the weekend, because Moblize consumes a lot more time. Andrew: I want to know if it’s happening again. And it’s myvirtualneighbor.com and you own the site completely? Amit: It’s all self-funded, Don’t need any investors right now but if there investors who are interested we would definitely entertain them. I think the problem is right now the challenge we run into is that no one wants to invest when you’re already busy with something, right. They want you to be a hundred percent focused, which is exactly what I believe in. So, to me it’s like a passive thing, let it keep going and we’ll see where we take Moblize. And after that it will be a full time because to me, it’s the next ten-year venture. Andrew: Well if someone in the audience is in the Mission District, or Burnell[SP] Heights, we’re actually technically in the Burnell Heights, but right in the Mission District area, Would you please sign up so that I can use this site with some people who I know? And frankly, if you’re in San Francisco at all please sign up so that I can connect with you. Frankly, we could be moving by the time this interview is posted, so wherever you are, I want to be connected with people on there. So I just signed up and hopefully I’ll be connected with more people than I already am. The website is, of course, mobilize we’ve been talking about and the new site is myvirtualneighbor.com. And if people want to say thank you to you, what’s a good way for them to connect with you? Amit: Thank you very much, Andrew. Appreciate it. Appreciate your time as well. Enjoyed it. Andrew: Thank you all for being a part of it. Bye guys.